Most breeds of dogs need to be groomed, but there are certain breeds that need more attention paid to their grooming routine. This needs to be taken into account when picking you chosen breed of puppy, how much time are you going to need to keep up with the daily maintenance, and then the cost of professional grooming sessions. When we picked Gus our puppy, we knew that we would be taking on a grooming commitment. He is a Goldendoodle, so a Golden Retriever crossed with a Poodle, a thought out breed for us. 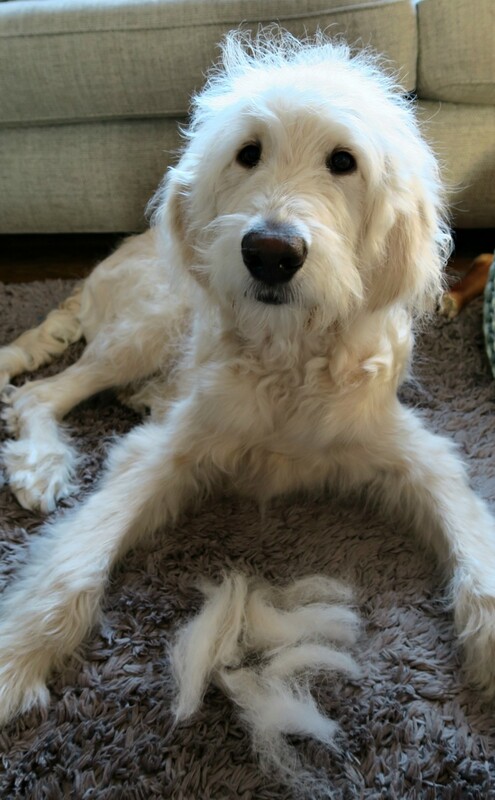 My girls are asthmatic, but we LOVE the Golden Retriever breed, however they shred their fur so much, so we went for one crossed for a Poodle, so that the fur will become more wiry and not shred as much. Please don’t think that all poodle crosses will not shred, as Gus currently is shredding and losing his fur. I am not sure if he is just loosing his puppy fur, or if he will be a shredding for life! However my girls are fine, so just means more vacuuming for me! 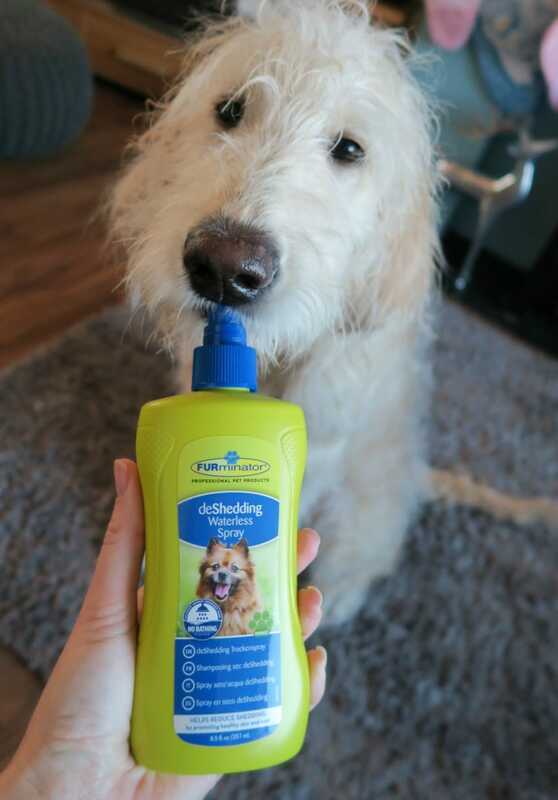 Having a Goldendoodle means Gus needs regular grooming, and depending on how his coat changes he will need professional grooming as well. This can be every 6-8 weeks! 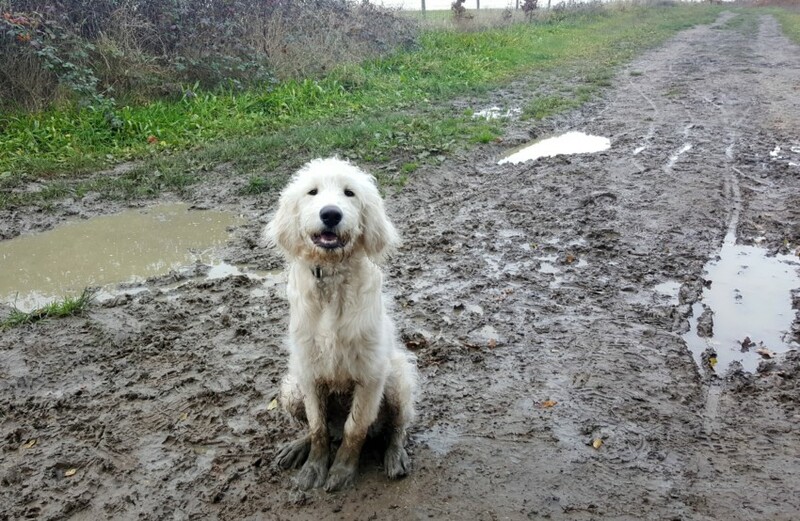 However when it comes to going out on walks, he does not stay looking clean or well-groomed! 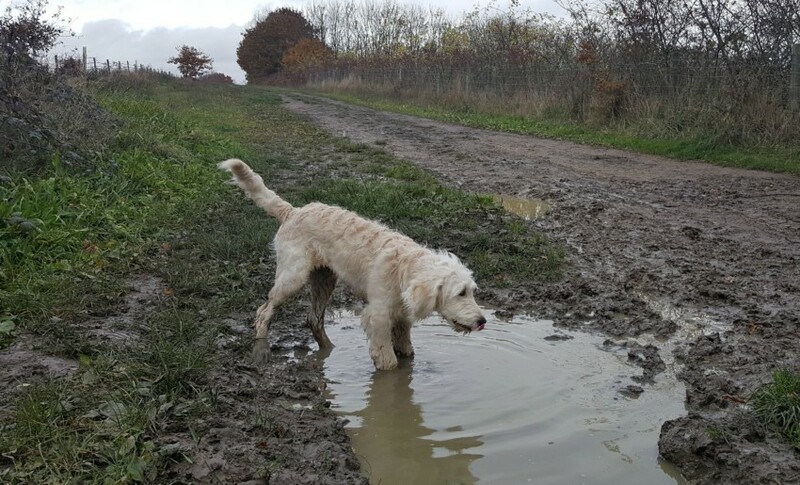 They are dogs, they don’t have walking boots to put on, they use their nose to sniff around on the floor, and most don’t avoid the puddles! 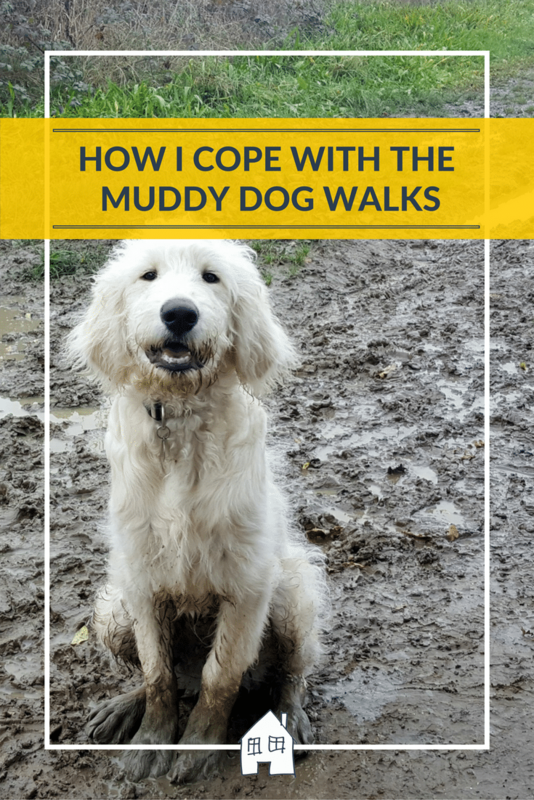 So it is perfectly normal for them to get muddy, and it doesn’t really bother me how muddy Gus gets, it can all be washed off. He is a dog and he is having fun! My only problem with it was the car, they cover the car in mud too and then we all get in it to go out places! I apologise to people when they get in my car, as I am sure it doesn’t smell that great!! To solve the problem of so much mud in the car, I fill a large fizzy drinks bottle with hot water before we go on our walk and leave it in the car boot. This will cool down by the time you have completed your walk, then you can just rinse off their paws before getting into the car. It is important to wash off their paws in the winter even if they are not muddy, to get rid of the salt used for the roads. 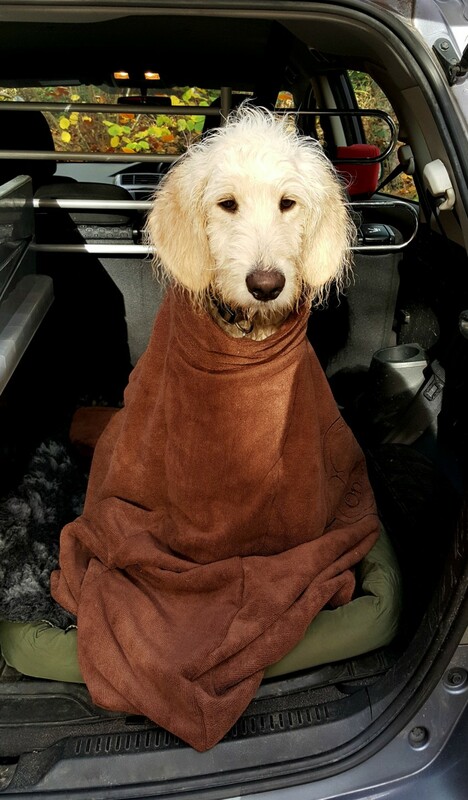 Gus also has a onesie for the car…….I purchased a PoochOneZee which I leave laid out on his bed in the car, after washing his paws off I place him in his little bag! I then can give him a good towel rub down to get the excess off and he can stay snuggled up in this until we get home. He has accepted it so well, and sits there to be zipped up! 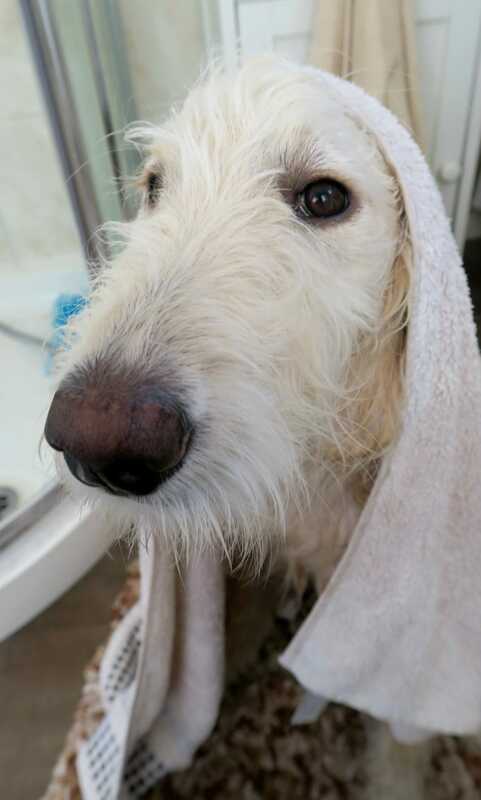 One day I would love a sink in the garage, where Gus can step up into and I can shower him down, but for now he has to go in our shower (I clean it after!). 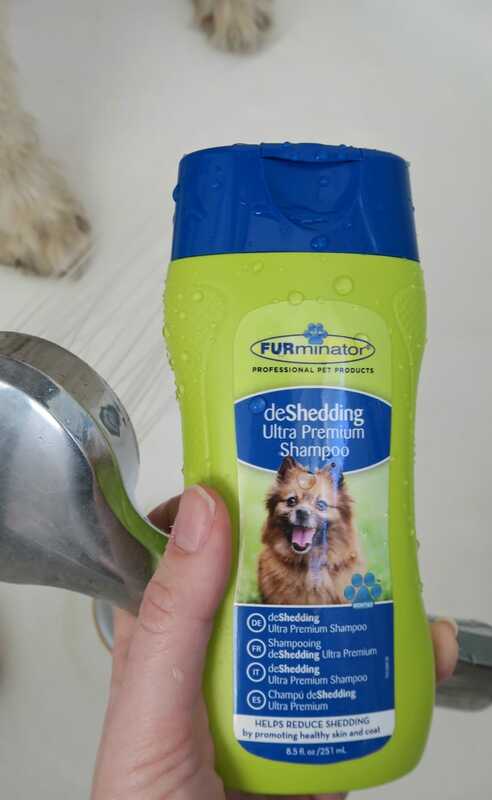 I have started to use FURminator DeShedding Shampoo for his showers, it promotes healthy skin and the dogs coat, which helps to reduce pet shedding. Also top tip, use a shower puff like this one, it really lathers up the bubbles on them and you don’t use as much shampoo on them. Keep a good supply of old towels, you can use these to towel dry them, watch out though for the shakes!! Just when you think they are dry enough, they shake and the amount of water that comes off them is amazing! They are very efficient at drying themselves! We have a general routine as a puppy to have a quick groom each day, I make it really positive with treats and short sessions, so that they can cope with it. If this is done regularly and always positive then the dog should always look forward to being groomed. Doing daily grooming sessions, also means you can keep on top of any mats, mats are really painful for your dog and should be removed. Yes you do see right, Gus is being rewarded with Primula cheese! I was given this tip by my puppy trainer, they love cheese and this can been easily given as you’re doing something with the other hand. You don’t give them a lot, as they are quite happy with licking it and getting a small amount. We have also been using the FURminator DeShredding tool to keep on top of Gus’s shredding, and when we first used it I would so surprised on how much fur we got out. I only used it for 5 mins max and this is how much we got out. 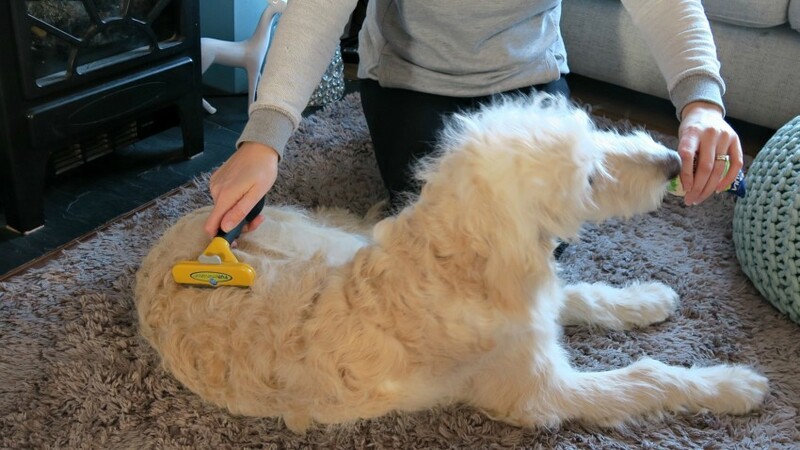 Another item we have been using is the FURminator DeShredding waterless spray, which is meant to moisturises the coat, and strengthen the hair shaft which will help to reduce shredding. I have been spraying this onto their coat, rubbing in and towel drying him. 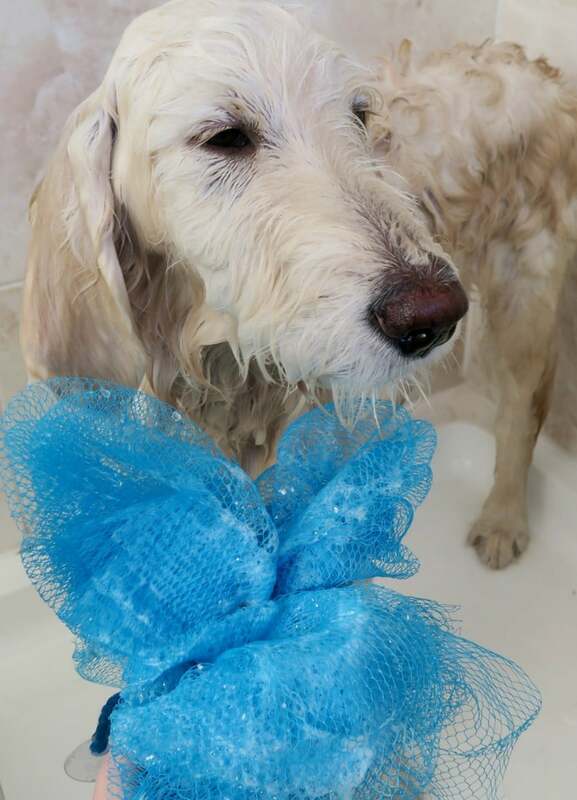 Gives him a freshen up without bathing as well. Along with daily brushing, I think we are going to reduce the shredding lots, and cope with the muddy dog walks quite well! oh so adorable. We don’t have any pets at the moment but my kids would love a dog!